Inspired by Vi Hart’s post about 3D printing an Apollonian gasket, I started to wonder whether it would be possible to get to that deeply Apollonian form through something more, well, Dionysian. After Xiao mentioned Zhuangzi’s lovely dream of the butterfly yesterday, I started thinking about the relationship (which has been discussed by many philosophers) between Dionysus, the god of beautiful chaos, and Apollo, the god of rational beauty. And I decided I would take a butterfly on a journey to attain a state of Apollonian perfection, but only after it has traveled through the chaos of dreams. 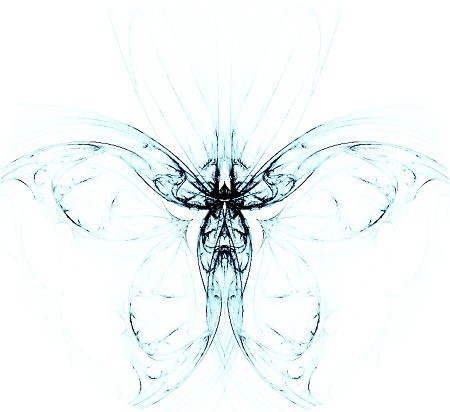 After playing around with some fractal programming, I found a suitable way to create and transform a mathematically defined butterfly (click on the image below to see the result). The cycle repeats endlessly because, of course, journeys in dreams are never finished. This entry was posted on Monday, December 6th, 2010 at 11:21 pm	and is filed under Uncategorized. You can follow any responses to this entry through the RSS 2.0 feed. You can leave a response, or trackback from your own site. I’m curious to learn how it works. Would you mind sharing the code? Absolutely BEAUTIFUL! Is the speed of the transformation something to do with the math? Thank you! It’s a mix of several things. The first time through it might be slow just because it’s an animated GIF file, so that first time it’s loading up the frames. After that the speed is a combination of the math and a little tweaking on my part (for example, I slowed things down at the beginning and end, so you’d have time to properly see movement of the butterfly and the Apollonian gasket). I had a dream i caught a butterfly last night, or the night before. So the question about the butterfly that I animated is this: was it dreaming it was the butterfly that you caught, or was it actually the butterfly in your dream?